A little late on this holiday post…but this is definitely a meal worthy of any time of the year, especially during the cold winter months when you need a hearty meal to warm you up. For me, I’m generally entirely satisfied at holiday meals as a vegetarian. Turkey, and especially ham, were never personal stars of the meal, even for the few years I did dabble in the meat department. With stuffing, mashed potatoes and gravy, and apple and pumpkin pie, it’s impossible to say I’ve ever gone home remotely hungry. It’s always quite the opposite, and even though I’m not cracked out on tryptophan like the rest of my turkey-induce fam., I’m still always ready for a long crash on the couch. So for me, a special vegetarian main is never a mandatory component to a Thanksgiving or Christmas meal. However, if I had it my way, the entire meal would be vegetarian-based, with all the traditional holiday dishes alongside some more innovative counterparts. Kale and garlic mashed potatoes? Yes please. These kinds of deviations don’t always fly in my family though, which is understandable because there’s something special about the standard annual traditions. However, with all the cooks in my family, the basics always get covered, leaving me to put on my thinking toque and allowing me to put my experimental cooking skills to work. Plus, I’m always jumping on the opportunity to cook for a crowd and make crowd-worthy dishes like this pot pie. Vegetarian pot pie might just be my all-time favorite comfort food. 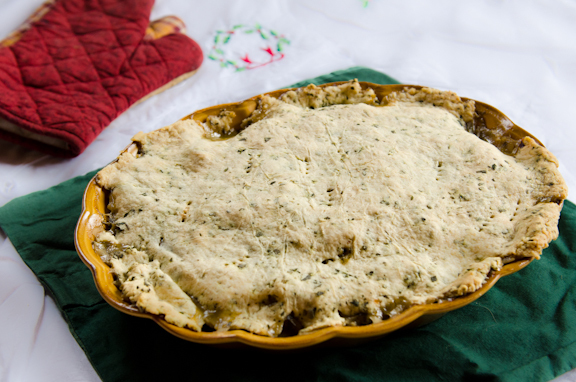 So even if I don’t have to have a vegetarian main dish at a holiday meal, a veg-friendly pot pie like this is always more than welcomed! Dare I say this is one of the best meals I’ve ever made? It takes a couple steps, but every step of the way is entirely worth it. 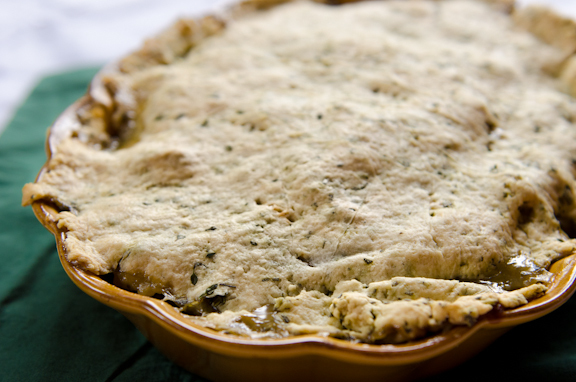 Feel free to substitute the butter to make this irresistible comfort meal entirely vegan. To make filling: Steam carrots and potatoes in steamer basket over boiling water until just tender, about 10 minutes. Remove from heat, and set aside. Heat oil in large pot over medium-high. Add onion, garlic, fennel and mushrooms. Saute until veggies are tender, adding salt halfway through. Stir in flour and saute for another minute. Add broth. Depending on the sodium content of your broth, adjust salt as needed. Saute another 2-3 minutes, or until veggie mixture begins to thicken. Dice potatoes and carrots. Add them to the pan, along with sage, thyme, veggie sausage, peas and carrots. Remove from heat. Lightly oil large casserole dish. Transfer to veggie mixture to the dish. To make the crust: Preheat oven 375F. In large bowl, use a fork to mix flour, butter and salt, until crumbly. Knead in cold water, 1 Tbsp. at a time, until dough begins to stick together (3-5 Tbsp. water). Knead in herbs. Place dough in a ball between two sheets of wax paper. Use rolling pin to roll out the dough to the length of the casserole dish. 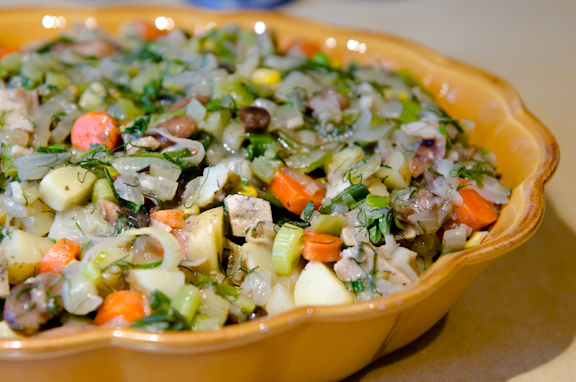 Remove top sheet of wax paper, and flip the dough on top of the veggies in the casserole. Seal any dough overhanging the edges to the dish. Use a fork to poke a few holes in the crust to allow the release of steam during cooking. Bake 40-50 minutes, or until top of crust is golden brown. Let stand 10-15 minutes before serving. That looks absolutely wonderful. I totally agree about being able to eat this sort of food all year round – why not? It’s not as if it becomes less delicious!